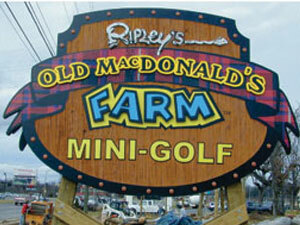 This Ripley’s sign was sandblasted with simulated wood grain and is painted to look like real wood. This example also contains multiple layers of HDU, full color digital print overlay, and custom neon lighting. The massive 8′ x 12′ HDUI signs highlight Ripley’s look and feel for uniqueness. For a look like no other, Baker Sign Group can design and produce the signs your company needs.